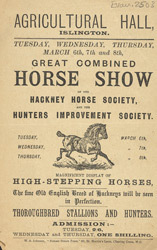 This leaflet advertises a meeting of the Hackney Horse Society. This was founded in 1883 and still exists today to promote the use of the Hackney horse today. The word 'Hackney' comes from the French ‘haquenee’ which was a language spoken in the medieval period. Hackneys were known as ‘ballerinas’ they were graceful and could be encouraged to trot by picking up their feet in a theatrical way. They were popular when pulling carriages as they looked grand and it was a show of flamboyance to own one.